Cheryl @Meadow Mist Designs released the September Meadow Mystery Quilt instructions on September 1st. 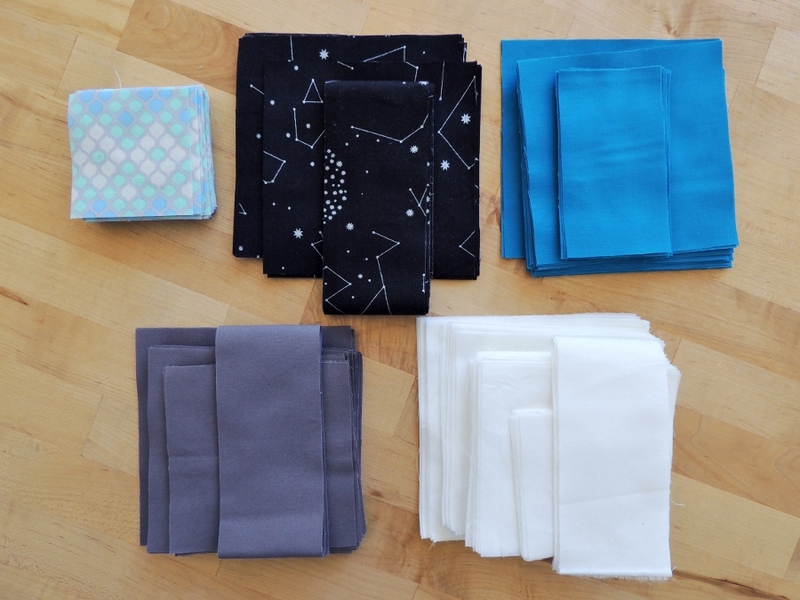 After looking over what we would be making this month and seeing how my fabric selections were going to come together, I realized that I was not going to be happy with my choices in the long run. Because I had chosen two different tones of colors for fabric groups B, C, and D, the block we were to piece this month was going to end up with 8 squares with dark gray and 1 square of light gray. Realizing that my choices were not going to make me thrilled now was not a problem; I just put the Peppered Cottons into my scrap bin and selected new Fabrics A, B, C, and D.
For Fabric A, I meticulously cut out the lighter areas of Tula Pink’s Mosaic in Glacier from her Eden line. Fabric B is Lizzy House Constellations, Silver on Black from her Natural History line, Fabric C is Kona Oasis, Fabric D is Kona Coal, and Fabric E is the same as before (Kona Snow). Whew! 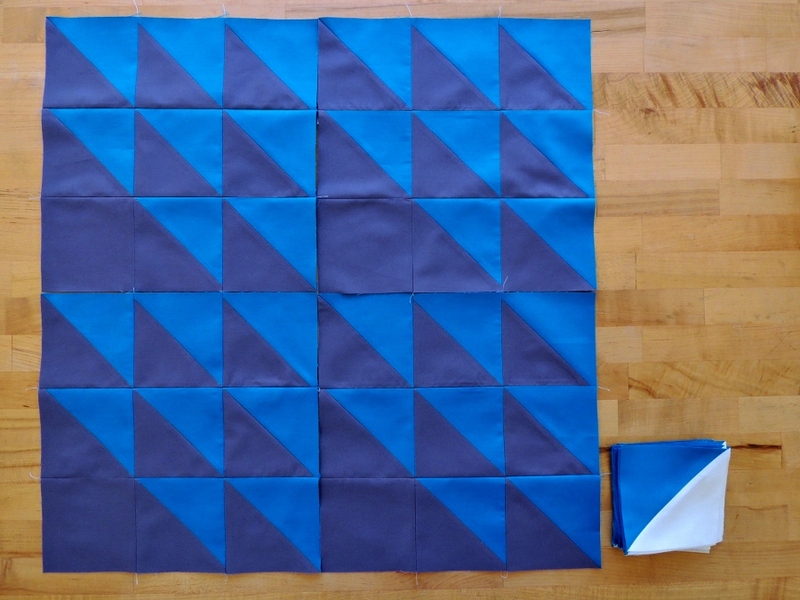 Making the HSTs and 4 blocks for the month was quick after that! I really appreciate how Cheryl had us not just make lots of sub-units (we made 60 HSTs this month), but we actually pieced some blocks, too. That was fun. I am feeling confident and excited about what comes next for October. Love your colors!! I can’t wait to see how all these different color combinations come together. I’m having fun with mine so far. I really like these new fabrics! Your blocks look great! This looks beautiful. The blues with the white will work nicely together. I like your September blocks. I’m looking forward to seeing how your quilt turns out. You can’t go wrong with blue. Love your blocks. I’m not so sure I like mine now but have my fingers crossed that it will all work out in the end. i’m crossing my fingers with mine as well….but I love how your new set is coming together. Kudos for getting the new fabrics cut and blocks made before the end of the month. Can’t wait to see the next step. Oooh this will be fun to watch come together! I love the night sky and the tula pink fabrics together! Pretty blocks! Can’t wait to see how all of our quilts turn out, I just finished sandwiching my Snowflake shimmer and started hand quilting it. Who knows maybe it will be done for Christmas!